Sorry I've been absent from here for a while, but I really think that this little achievement deserves a post. As you may remember I have gotten heavily hooked on working with wet plate collodion technique and it's been a non-stop obsession ever since I poured my first plate in the spring of 2013. The intrinsic beauty, uniqueness and incredible archival quality of the images combined with the relative difficulty and immediate feedback of the process is truly riveting. 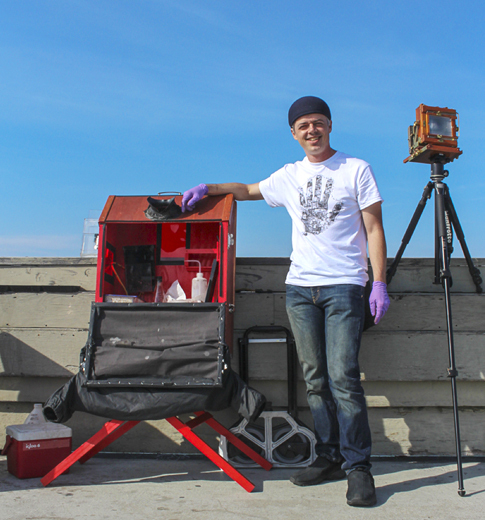 Some of you may know that collodion emulsion is equal to about ISO 1 at it's fastest, so exposure times usually range into multiple seconds even with fast acting vintage lenses built for that purpose. Needless to say, action sports photography is not something attempted by those who practice this craft today. 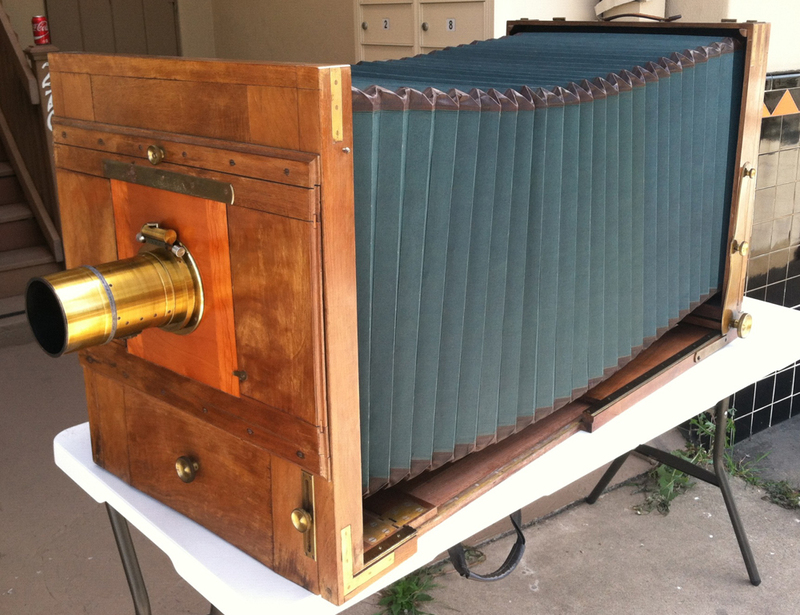 Even in the 19th century very few have pointed their wet plate cameras at moving subjects. most notable of course was Edward Muybridge, who in mid 1870s did somehow achieve his spectacular results by capturing a galloping horse in full stride to settle an argument of whether or not all four legs of the animal left the ground at some point during the stride. How he did it I am not certain, but I believe there soon will be a detailed explanation provided by a photo historian and a great wet plate photographer Luther Gerlach (possibly in a form of a movie). All I know is that Muybridge's efforts were fully sponsored and close to a modern equivalent of $1M to produce and included modified emulsion, custom made lenses, trip wires and so on. Not to discount that great man's miraculous efforts, but that was a set up scene and it wasn't truly 'action sports' in my humble opinion. Neither were the more recent and rather famous plates of skaters. The photographer there set up a tremendous amount of strobes and also the skaters were told when and where to jump - again, hardly qualifies as true action sports in my eyes, more akin to shooting taxidermy than wild life. I can come upon a few historic images featuring people at an archery range, but that sport doesn't include much moving... Aside from that there's nothing that I can find depicting real live action on a sports field or arena. In all honesty, I wasn't thinking about the historic precedence or conducting any research while conceiving my idea of shooting surfers on waves. 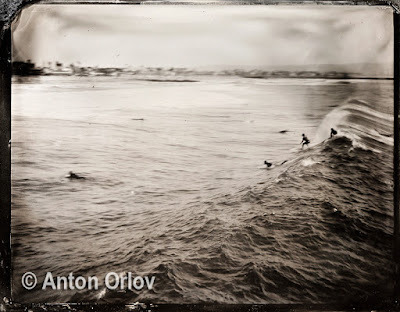 I live in San Diego, surf-central, and have been surfing for a good decade or so, though lately I've been doing a lot more photography than wave-riding. 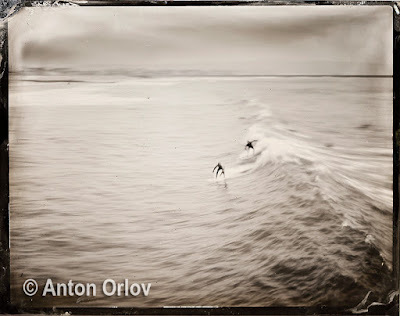 So all I was thinking was how fun and challenging it would be to use my wet plate skills to get an image of the action. Last Friday I finally got together everything I needed to try this. A week prior I finally got a lens I've been coveting for a while - a WWII areal surveillance 7in f2.5 Kodak Aero Ektar. I also had a shutter that happened to fit this lens - I believe it is from 1950-70s and was made by a Japanese company with a friendly name of Tommy. The shutter is based on the Thornton-Pickard design of late 1800s and has the same limited range of speeds (1/30-1/90). With my two week old collodion mix, which has been staying very fast due to refrigeration, I decided to give this seemingly insurmountable goal a try. To do this I went to the Ocean Beach pier, knowing that the waves there break pretty close to a point where I can set up my mobile dark box. The weather cooperated and just at the time that I had my equipment set up and chemistry out the marine layer that plagues the beaches of southern California during this time of the year finally burned off, giving me nice sunshine and maximum UV power to make my exposures with. 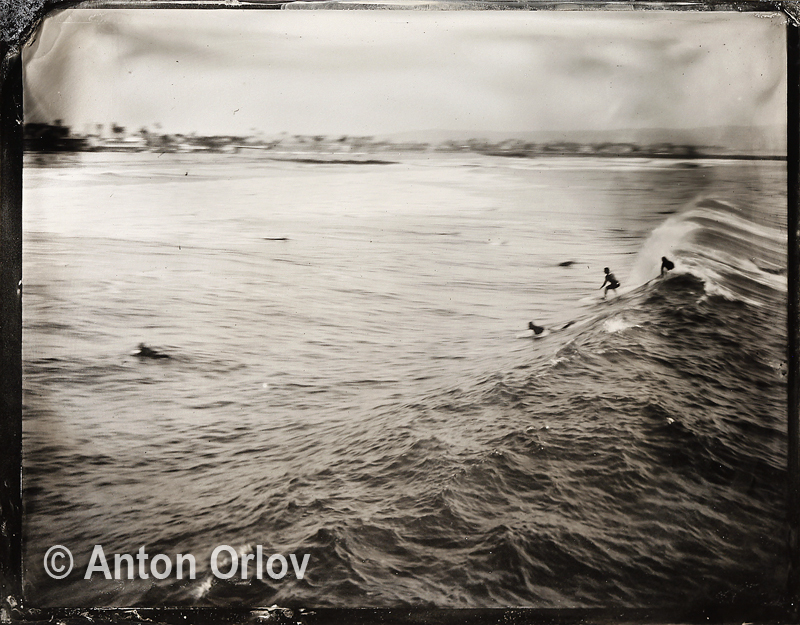 I may need to remind my readers that with wet collodion process the plate need to be sensitized, exposed and developed before the emulsion dries, so I was really at the mercy of the swells and the skill of surfers present below the pier - a big enough wave had to come within a couple of minutes of me loading the plate into the camera and then someone had to be good enough to catch it! 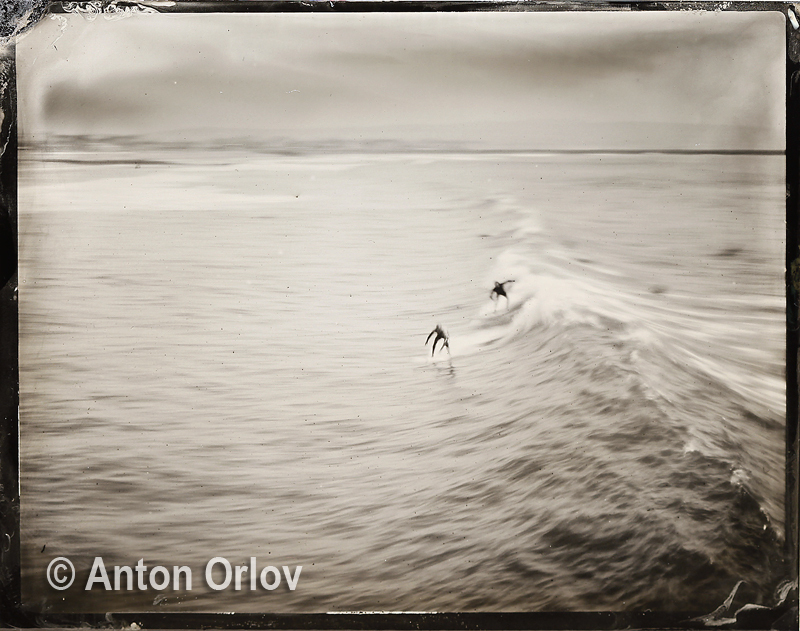 Well, the surfing gods apparently coordinated with the gods of collodion because below are the two plates selected from my shoot (I did a total of 4 actually and they are all actually rather decent, but these two are my favorite). A few people stopped by to see what I'm doing and one of them happened to have a camera and made this exposure showing me next to the self-made dark-box and the Zone VI 4x5 camera used to make the above plates. In other news - I am getting ready to put The Photo Palace Bus to use again after some time off the road. First post-break trips will probably be around San Diego and the vicinity and I'll be looking forward to shooting with wonderful 40x50cm Ernemann Reisekamera (Travel Camera in English) that I am currently fixing up and outfitting for wet plate photography. I will NOT be attempting to make plates of surfers with it!